Most of us don't expect to be served up Michelin-starred cuisine when flying -- but sometimes the bar is set just a little bit too low. 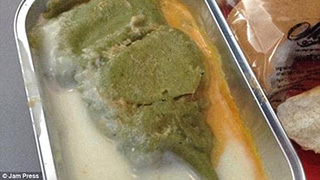 UK newspaper The Daily Mail says the bar can actually hit the subterranean level, and sets out to prove it with an online gallery of some of the worst meals pax have ever encountered on planes. One snap shows what is meant to be a grilled cheese sandwich, but looks more like a piece of packing foam. Other unappetizing meals include a tray full of green mush, a bizarre looking burger and a teeny-tiny sandwich with a huge chunk of cucumber in the middle. Typical breakfasts don’t cook up well in the air either. There are images of rubbery eggs, pale, flabby sausages and bizarre-looking baked beans. On the other hand, as a recent WestJet flight for this OJ writer revealed, airline food doesn’t have to be horrible. 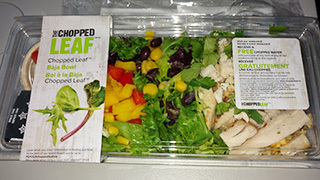 We bought a Baja Bowl, the result of the airline’s recent partnership with “fresh casual restaurant” chain Chopped Leaf. The combo of rice, beans, kale, veggies, sour cream and salsa was actually delicious and filling.